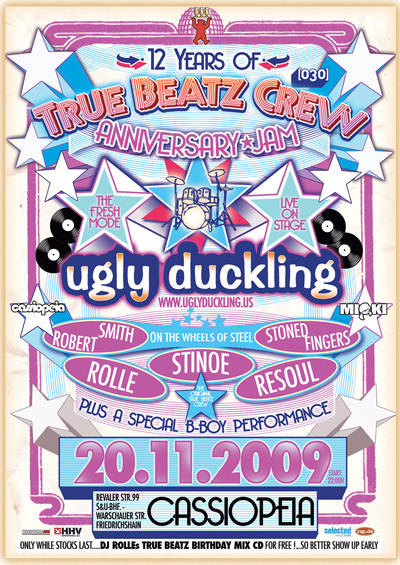 TrueBeatz is a DJ Crew of 5 members (Rolle, Stinoe, Resoul, Stoned Fingers & Robert Smith). Rolle and Stinoe first got together in 1997. Resoul joined them in 2003, Stoned Fingers 2004 and afterwards Robert Smith became a member. Their music has a wide range of Funk, Soul, Latin, Reggae mixed with Broken Beats and Hip Hop classics. It’s served on 3 to 4 turntables. In regular intervals they perform at the Bohannon Club. You can also see them at different clubs in Berlin such as Cassiopeia, Lovelite, Icon, Magnet and Rosis. In addition they play in Baden(CH), Dresden, Leipzig, Tübingen, Hannover, Dortmund or even the small town Goerlitz and other german cities.